Who among you has NOT read the Little House books? They are a staple of childhood, and I find myself rereading them now that I….ahem, am not a child. I also absolutely love, love, love the show. I have seen every episode so many times I can recite the dialogue and challenge anyone out there to an online Little House quiz. My hubby is from the great Midwestern state of Minnesota. This past June, we took a trip to Minneapolis to visit family and friends. No sooner did we hear our first “Ya, ya betcha!” at the airport when I put a bug in his ear that Walnut Grove just happens to be in the state that we are currently standing in. So we loaded up on sunscreen and decided to make the 2 ½ hour trip there in our rental car. 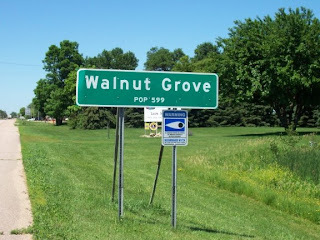 For those unfamiliar to the location of Walnut Grove (which I think is pretty much everyone), it is smack in the middle of nowhere. For Little House fans, it is like a mirage when you see the green sign. Some big dorks even pulled over to take a picture of the sign (oh yeah, it was us). We went to a great museum, with artifacts from Laura’s days and memorabilia from the show. I was most excited to see the actual fireplace from the show and Doctor Baker’s bag! The story of Laura’s life is so interesting, and the museum tells it in a very informative way. 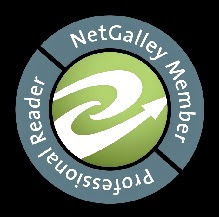 The teacher in me came out in the one-room schoolhouse when I ordered my husband into the corner. 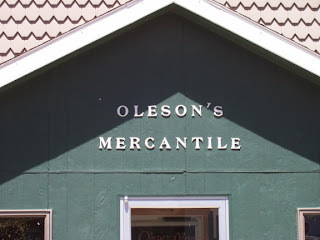 We then drove to Oleson’s Mercantile. It doesn’t sell any souvenirs, but it sells some nice gifts. The highlight of the trip, however, was going to PLUM CREEK!!!! For $4.00 a carload (entirely on honor system…..gee, Pa, we’re not in Philly anymore), you drive down a long dirt road, park, and walk exactly where Laura walked along Plum Creek. The depression where the Ingalls dugout once stood is there. You can stand on top of it. We waded in the creek. During this trip, I was determined to reenact the opening of the show when the 3 girls run down the hill (even Carrie’s fall). However, there really were no hills to be seen, so my husband videoed me running in slow motion (like Chariots of Fire) on a plain. I even sang the theme song (well, it has no words, so I hummed it). Yes, you are truly meeting the biggest Little House fan.